PKU is an abbreviation for phenylketonuria, an inherited amino acid disorder. PKU affects the amino acid, phenylalanine, which is one of the amino acids that are the building block of protein. In PKU, there is a defect in the chemical or enzyme that breaks down phenylalanine to another amino acid tyrosine. The liver enzyme that is affected is phenylalanine hydroxylase. PKU is a disorder that occurs with a wide range of severity. The form of PKU that is associated with essentially no enzyme activity and the highest blood phenylalanine (phe) levels is referred to as the classical type. Individuals with some remaining enzyme activity and less severe elevations of blood PHE levels are referred to as having variant or mild PKU or, in the least severe case, being hyperphenylalaninemia (hyperphe).The average incidence of PKU worldwide is 1 in 15,000 births and the disorder can affect all genders, races, and cultures. A pioneer researcher in the early 1960s, Dr. Robert Guthrie, developed the first screening test for PKU. Prior to this test, most children with PKU developed severe mental retardation and many were undiagnosed. The good news today is that all states in the United States and many countries throughout the world now screen for PKU at birth. Illinois started their first newborn screening program in 1964 which is part of the Illinois Department of Public Health. The test is initiated on all babies, after 24 hours of life, with their blood spots obtained from a heel stick and placed on a filter paper card and sent for analysis to the state screening lab. Although PKU was the first disorder for which newborn screening was implemented, many other treatable disorders are now included and the list continues to expand. Babies that are found to have an elevated phenylalanine level (greater than 2 mg/dL or 125 uM/L) on the initial newborn screening test are referred to one of four state approved metabolic physicians who treat PKU. In Illinois, these physicians are located at Children’s Memorial Hospital, University of Illinois at Chicago Medical Center, or Rush University Medical Center (see clinic link for more information). Patients in the southern portion of the state may be referred to Washington University in St. Louis, if more convenient to their home. When the baby is initially seen at a PKU clinic, additional quantitative testing is performed with blood and urine. If the follow up testing determines that the baby truly has PKU and has a blood phe level high enough to require treatment, then the baby’s family would be instructed by the metabolic clinic team in the treatment plan for the management of PKU.The initial treatment of PKU typically consists of a special diet to lower blood phe levels. Some patients with PKU can also be treated with a medication called sapropterin or BH4 (trade name Kuvan). Patients on this medication usually also require some dietary modifications but a few can be managed on medication alone. If treatment for PKU is initiated early and followed correctly, then children can expect to live a normal life. Treatment to control blood phe levels is recommended for life. Although mental retardation does not occur when treatment is abandoned in adolescence or adult life, other problems with brain functioning as well as other health issues are commonly observed.When a baby is diagnosed with PKU, dietary treatment is typically started with the addition of a special medical food that is phenylalanine free. A recipe is individually calculated for each patient by a metabolic dietitian. Small amounts of PHE must be given, since this is essential to normal growth and development and this can be provided by breast milk or standard infant formula to be used with the phe free formula (referred to as a medical food). The management for PKU whether by diet, medication, or both, is ongoing and parents need to work closely with the PKU metabolic team, i.e. physician, dietitian, genetic counselor, social worker, or other health care professionals. The dietary intake, blood PHE levels regularly obtained on an age appropriate schedule, and growth of the baby are all considered in making any treatment changes. The goal is to keep the blood phe levels in the optimal metabolic range, usuallly considered to be below 6 mg/dL (360 uM/L). As the baby/child gets older solid foods that are low in phe are introduced into the diet on a calculated and individualized basis which is adjusted based on blood phe levels. The major source of protein for overall health and growth for most individuals with PKU is the medical food. Variable amounts of natural protein containing phe are provided from the solid food portion of the very restricted protein diet. The foods that are allowed are those which are lower in phenylalanine such as fruits, vegetables, and specific types of low protein foods. Foods of higher protein content typically have too much phe and should be avoided. These would include meat, fish, poultry, dairy, eggs, most bakery products, and convenience foods. Reading food labels for protein content and checking the milligrams of phe or phe exchanges with the help of the low protein food lists and the assistance of the clinic staff is an ongoing process. Financial coverage for medical foods (formulas) and low protein food products varies considerably from state to state. Patients in the state of Illinois are fortunate to have coverage for many different phe free medical foods for all ages through the Illinois Department of Public Health Newborn Screening Program. However, to qualify to receive medical foods at no out of pocket cost through the state, patients need to be managed on a regular basis at one of the metabolic treatment clinics. 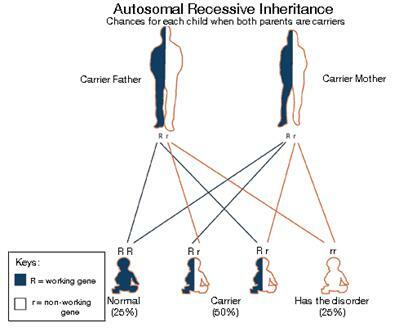 PKU is an inherited, autosomal recessive disorder, which means that both parents of a PKU child are carriers of a PKU gene. Carriers have one normal gene paired with one PKU gene, and have no symptoms related to the presence of the one altered gene. Only when a child has two PKU genes, with no normal gene in that gene pair, do symptoms of PKU and a significantly elevated blood phe level occur. As you can view from the diagram, there is a 25% chance with each pregnancy that a child born of carrier parents will have PKU. There is a 50% chance that a child born to carrier parents will also be a carrier for the gene. There is also a 25% chance that a child born to carrier parents will neither carry the gene nor have PKU. Our knowledge about PKU has continuously developed since newborn screening was first initiated. It was realized in the 1980’s, that many women with PKU who had gone off diet were of childbearing age and having children with birth defects and mental retardation. Although these infants rarely had PKU, their development during pregnancy had been adversely affected by the high blood PHE levels transferred across the placenta from the mother with untreated PKU. The pattern of abnormalities seen in infants born to women with poorly controlled PKU is referred to as the Maternal PKU Syndrome. The abnormalities observed include: growth and mental retardation, microcephaly (small head size), congenital heart disease, abnormal facial features, and behavioral problems.Through an International PKU Collaborative Study, funded by the National Institute of Health from 1984 through 2002, many women were enrolled to study offspring of women with PKU, both on diet and off diet, and compare them to infants born to women without PKU. One of the discoveries from the pregnant women with PKU was that the deleterious complications can be prevented by establishing good metabolic control prior to conception or in the very early stages of the first trimester of pregnancy and monitoring it throughout the pregnancy. This should be done with the help of a metabolic physician and dietitian who need to be contacted prior to the pregnancy or as soon as the pregnancy is discovered. The treatment prescribed will be different for someone that is pregnant, since an increased protein intake is necessary for the growth and well being of the baby. The increased protein and other needed nutrients are primarily prescribed through the special medical food free of phenylalanine, although later in pregnancy an increase in phe intake is often possible. Blood PHE levels need to be monitored frequently during pregnancy usually twice weekly. The levels should be in the optimal metabolic range of 2-6 mg% (125-360 uM/L) for the best chance of delivering a healthy baby. For women who are preparing for pregnancy there is a group chat on yahoo groups specifically designed for women with questions relating to maternal PKU. Go to Yahoo Groups, or by clicking here for the MaternalPKU Yahoo Group. You will need a Yahoo account to join and then give a brief descrition of yourself to join.